Christopher Hall is an artist who works primarily as a painter though his practice has included film, installation, photography and live event/performance. 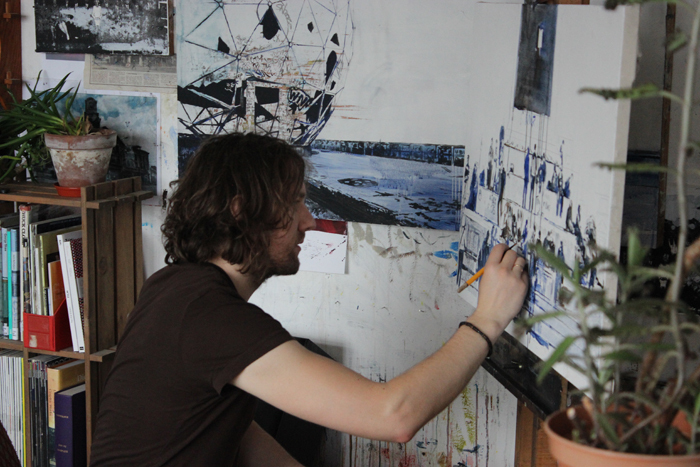 He was the winner of the Swinton Foundation Prize at New Lights 2013. Born in the Midlands and a Fine Art graduate of Leeds School of Art, Christopher has exhibited widely in the UK and Europe. His paintings and artworks have been widely acclaimed, and can be found in many private collections. His paintings are methodical and a collage-like; strewn with half-buried fragments, scrubbed out lines, appropriated material and allegorical references. The discipline and craft of oil painting finely balanced with a compulsion to experiment. Likewise the ‘failings’ and idiosyncrasies of his method are singularly embraced, encouraged even; they are allowed to change the course of the work and take it in new and unexpected directions.